3.) Mini Book – “What Will We Learn Mini Book” – An emergent reader for the first day. Each page has a picture for your student to color. You can read the book together (k-1) and then have the students take it home to share with an adult. 5.) How Did You Get Here? – A tally and graphing activity. Students must tally how their new friends got to school. They must then color the given graph to match their tally marks. Then they are asked to answer a few questions about their graph. This can be done as a group activity (1-2) or as an independent activity (3). 6.) Graphing For Back To School – Student cuts out given pictures and pastes them to a given graph. The student must answer questions about the finished graph. (1-3). 10.) Lucky Charms Bag Topper – Print on cardstock and staple to a Ziploc bag of Lucky Charms Cereal. Give to your students to take home on the first day of school. 11.) 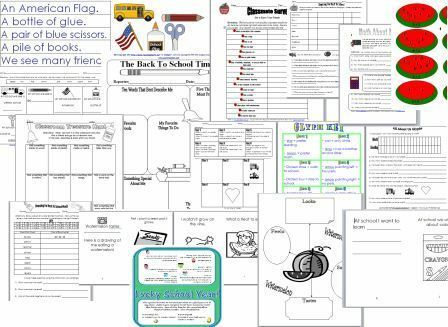 Back to School Pocket Chart – Student matches pictures to the text in the pocket chart. Sentence strips and pictures are included. Also included is an independent activity sheet for the student to complete. 12.) Get to Know You Glyph – This includes the glyph for your student to create, a bulletin board display for you to use as a center, and a center sheet for your students to complete while at the bulletin board (1-3). 13.) Balloon Strips – For an icebreaker, place slips in balloons. Kids sit on the balloon to pop it. They then read the question and answer it. 14.) Classmate Bingo - Color the bingo card. Place the names of your classmates in the blank boxes. Your teacher will call out names. The pictures are free spaces. Put a pretzel on the names she calls. If you get four in a row, yell CLASSMATE BINGO! 15.) Classmate Survey - Walk around the room and find classmates that fit these categories. If they do, have the classmate sign their name next to the survey. See how many different names you can get. Your teacher will tell you when to begin and end. 18.) Watermelon Flavor Graph – You will need to allow your students to taste a watermelon, watermelon flavored gum, watermelon flavored Jello, and watermelon flavored Kool-Aid before doing this activity. They should then decide which one they like the best. Then have them complete the activity sheet. The sheet asks them to tally up each classmates favorites (You may choose to do this part of the activity as a class exercise). Next, they color in the graph to match the tally marks. Finally the sheet asks them answer questions about their work. $12.99 - 20 files- crazy good deal!